SURBANA International Consultants yesterday officially launched its academy, which will become a platform for it to share affordable housing development and city management solutions with regional developing countries and, it hopes, pave the way for new project opportunities abroad. "The academy, in a sense, is a platform for government officials from overseas to find out more about how we do things. If they trust us and like the way we work and there is a lot of comfort between them and us, and they have real projects on the ground, then Surbana Academy - if we want - can provide consultancy to them," Ng Beng Eng, director of corporate services who will also head Surbana Academy, told BT. It also helps that many of the overseas government officials who will attend the academy's programmes are people in decision-making positions. "Having an academy is a tool for us to get to understand the local situation, for us to network with the decision-makers there, and then influence them in what the best practices should be so when they make decisions . . . they would be more inclined to choose Surbana as a consultancy," Surbana's chief executive Pang Yee Ean told BT. The academy was launched on the sidelines of the World Cities Summit at the Sands Expo & Convention Centre. In his speech at the launch, Mr Pang said it primarily targets developing countries in the region with urgent affordable housing needs such as China, Myanmar and Vietnam. China, for instance, aims to provide social housing to 23 per cent of the urban populace by 2020, up from about 14.3 per cent last year, and would require 30 million units over the next seven years. 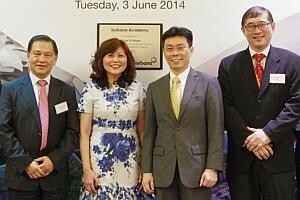 "This comes at a time when housing prices are beyond the purchasing power of ordinary people," Mr Pang said. Meanwhile, Myanmar's government is building 30,000 low-cost homes on the outskirts of Yangon by 2016, while Vietnam targets to provide 10 million square metres of social housing by 2015, he added. The academy has conducted 10 programmes since its inception last May for senior government officials from China, Vietnam and Indonesia, sharing its approaches in urban planning, land reclamation, transportation and infrastructure. Its programmes will be interactive, including discussions on project case studies, site visits and opportunities for collaboration on research and development. Surbana will also offer post-training internships to, say, foreign urban planners, to extend classroom learning to hands-on experience. Surbana was corporatised from the Housing and Development Board's building and development division in 2003. It was conceived under the statutory board in the 1960s to help alleviate Singapore's severe housing shortage at the time. It is this "ex-government" heritage that gives Surbana its unique proposition, Senior Minister of State for Trade and Industry and National Development Lee Yi Shyan said yesterday as guest of honour at the launch. He noted that the challenge for mayors and city leaders goes beyond mere urban planning and township development; they also have to find the resources, govern the people and sell them certain ideas in order to execute the project. "Many of the Surbana staff today were ex-government (people), so they know how government departments think and plan long term." But Surbana also has the flexibility and responsiveness of a commercial entity today, he said. "With Surbana launching its academy here, it represents yet another commitment to centralise and distillate its knowledge in a ready form for consumption to its customers." The academy is also partnering local universities to extend its curriculum to other senior government officials and improve the scope and depth of its programme offerings. At the launch, Surbana also signed a memorandum of understanding (MOU) with the City of Quelimane to design its master plan, marking its first foray into Mozambique and - if the deal materialises - its seventh project in Africa.